I do enjoy classical guitar music, but there isn’t a huge choice on CD. There is one very special piece called “Gran Vals” by Francisco Tárrega, written in 1902. This piece has a unique reputation as it contains a phrase that was once the most listened-to piece of music in the whole world. Just a few bars into the work one can hear the celebrated Nokia ringtone! A country’s Gross National Product (GNP) is the value of all services and products produced by its residents in a particular year. GNP includes all production wherever it is in the world, as long as the business is owned by residents of the country concerned. Gross Domestic Product (GDP) is different, although related, and is the value of all services and goods produced within the borders of the country for that year. The helots were a population of poorly-treated slaves who served the citizens of Sparta. Kylo Ren is the son of Han Solo and Princess Leia Organa in the “Star Wars” universe. The character’s birth name was Ben Solo. He was trained as a Jedi knight by his uncle, Luke Skywalker. However, Ben came to embrace the Dark Side, and changed his name to Kylo Ren. Ren is played by actor Adam Driver. Queen of France Marie Antoinette is credited with popularizing the elaborate hairstyle known as the pouf. The hair was styled using a pomade made from wholesome ingredients such as beef marrow and bear grease. Because of the complexity of the hairstyle, ladies wore it for a week or two, during which time the animal fat would become rancid. It was reported that vermin would be attracted to the hair while sleeping, which apparently led to the phrase “her hair is a rat’s nest”. Jesus Alou played Major League Baseball, as did his brothers Matty and Felipe, and as does Felipe’s son Moises. Loma Linda is a city in California located not far from Los Angeles. The name Loma Linda translates from Spanish as “Beautiful Hill”. Kia have been making the subcompact model called a Rio since 2000. Tris Prior is the protagonist in the “Divergent” series of movies, and is played by actress Shailene Woodley. Termites are insects that are somewhat unique in that they can digest cellulose (as can ruminants such as cattle). Because of this diet, they cause a lot of trouble for human populations by feeding on wood in man-made structures. Evan Hunter was the adopted name of Salvatore Albert Lombino, an author and screenwriter from New York City. Hunter had a pen name that was perhaps more famous, namely Ed McBain. As McBain he wrote a successful string of crime novels starting in 1956. As Evan Hunter, he is perhaps most famous for his 1954 novel “The Blackboard Jungle”, which was made into a successful film the following year. To have more fun than a barrel of monkeys is to have a great time, lots of fun. Apparently, the expression dates back at least to 1840, when it took the form “cage of monkeys”. There was a “wagonload of monkeys” by the end of the 19th century, and somehow a subsequent relocation into a “barrel”. A lien is the right that one has to retain or secure someone’s property until a debt is paid. When an individual takes out a car loan, for example, the lending bank is usually a lien holder. The bank releases the lien on the car when the loan is paid in full. The word “tattoo” (often shortened to “tat”) was first used in English in the writings of the famous English explorer Captain Cook. In his descriptions of the indelible marks adorning the skin of Polynesian natives, Cook anglicized the Tahitian word “tatau” into our “tattoo”. Tattoos are also sometimes referred to as “ink”. New-Age music is created to provide a relaxing and stress-free atmosphere. The New Age movement is often said to have begun with the release of an album called “Spectrum Suite” by Steven Halpern in 1975. Nehi Corporation was the nickname for the Chero-Cola/Union Bottle Works that introduced the Nehi drink in 1924. Years later the company developed a new brand, Royal Crown Cola (also known as RC Cola). By 1955, RC Cola was the company’s flagship product, so the “Nehi Corporation” became the “Royal Crown Company”. In 1954, RC Cola became the first company to sell soft drinks in cans. Corporal Radar O’Reilly is a character in the “M*A*S*H” television series and film. The role was played by Gary Burghoff in both the film and on television. The Orem Owlz minor league baseball team is affiliated with the Los Angeles Angels. The Owlz mascot is a red owl named Hootz. Hoots married the love of his life Holly in an on-field ceremony in 2009. Kelps are large seaweeds that grow in kelp forests underwater. Kelps can grow to over 250 feet in length, and do so very quickly. Some kelps can grow at the rate of 1-2 feet per day. 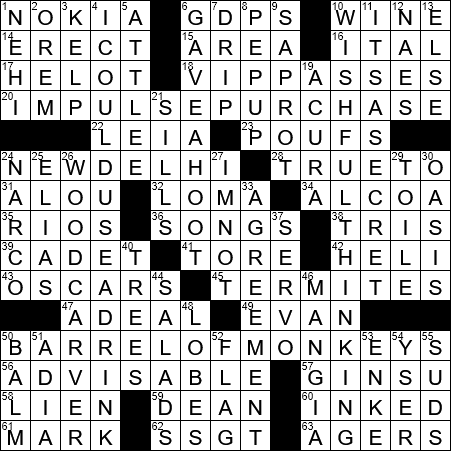 … after struggling with that crossword. Clement Attlee served as leader of Britain’s Labour Party and as Deputy Prime Minister in the coalition government during the war years under the leadership of Winston Churchill, a Conservative. Attlee swept into power right after WWII in a landslide victory over Churchill and was responsible for major changes not only in Britain but around the waning British Empire. It was under Attlee that former British colonies like India, Pakistan, Burma, Sri Lanka and Jordan became independent. Also, the Palestine Mandate was terminated in 1948, while he was in office, with the state of Israel being declared the very next day. “Nae” is the Scottish vernacular for “no”. The Acura Legend model of car was sold as the Honda Legend over in Japan. “Sill plate” or simply “sill” is an architectural term for a bottom horizontal member to which vertical members are attached. A windowsill is a specific sill plate that is found at the bottom of a window opening. “The Adventures of Pinocchio” is an 1883 children’s novel by Carlo Collodi, which is all about an animated puppet called Pinocchio, and Geppetto, his poor woodcarver father. In one of his adventures, Pinocchio encounters “the Terrible Dogfish”, a huge sea monster that is given the nickname “the Attila of fish and fishermen”. The sea monster features in the 1940 film “Pinocchio”, but in Walt Disney’s version it is given the name “Monstro” (the Portuguese word for “monster”). Toile fabric can be used as upholstery, or as a wallpaper, or even as a fabric for clothing. An isolated area of vegetation in a desert is called an oasis (plural “oases”). As water is needed for plant growth, an oasis might also include a spring, pond or small lake. A servomechanism (also “servo”) is a control system in which usually a hydraulic or pneumatic arm or plunger is actuated by a low-energy signal received from a sensor. An example is the device operating the cruise control on a car. The servo pushes the gas pedal to accelerate and lets off to slow down. The signal to the servo comes from the speedometer. 46. Italian “Eat!” : MANGIA! “Mangia!” is Italian for “Eat!” and is often used in the names of Italian restaurants or in brand names of Italian foods. The temporal lobe is one of the four main lobes of the brain, the others being the frontal lobe, parietal lobe and the occipital lobe. The temporal lobes (there is one on each side of the brain) are associated with visual memories, understanding language, and emotions. The “temporal” name comes from the fact that the lobes are located behind the temporal bones, the bones beneath the head’s temples. The temples are named from the Latin “tempus” meaning “time”. The idea is that a person’s age shows with greying of the hair at the temples. Sarah McLachlan is singer/songwriter from Halifax, Nova Scotia who lives in Vancouver. In 1997, McLachlan married Ashwin Sood, the drummer in her band. The 1998 hit song “Adia”, which she co-wrote and recorded, was intended as an apology to her best friend … for stealing her ex-boyfriend and then marrying him! Karin Enke is a former speed skater who represented East Germany in competition in the seventies and eighties. The Yser is a river that originates in northern France and flows through Belgium into the North Sea. The Yser is often associated with WWI as it figured in a major battle early in the conflict. In the first three months of the war, the German Army pushed almost completely through Belgium, inflicting heavy losses on the Belgian Army as the defenders were forced to fight a fast-moving rearguard action. The Germans were intent on pushing right through Belgium and across France in a “race to the sea”. But the Belgians, with the help of their Allies, decided to make a final stand at the Yser Canal in an effort to prevent the Germans reaching the French ports of Calais and Dunkirk. The 22-mile long defensive line was chosen at the Yser because the river and canal system could be flooded to create a barrier that might be defended. The plan was successful and the front was “stabilized”. As we now know, millions of lives were lost over the coming years with very little movement of that battle line. 11. “Shh! Don’t tell anyone!” : IT’S A SECRET!